Even though tomorrow never saw the light of day for my Gujarati dal made with kokum, I like to think and work towards a tomorrow for all the important things in life. And that is what I have been busy with. A brighter tomorrow. At least that is how I like to look at it. Life has been full of surprises over the past couple of months. I touched briefly on how cancer has touched our lives again on A Mad Tea Party, which has since reverted to being the fabulous blog it used to be, heart and soul intact! Suddenly, everywhere I turned, there were more and more people I knew that had cancer of one kind or the other. Our school district lost a feisty young drama teacher Tracy Ayers, whom we supported through our prayers and thoughts as she waged a battle for her life. An online acquaintance, Gloria Craney, also passed away in April. Her cancer remained undetected because she did not have adequate health insurance to pay for the hideously expensive treatment she so deserved. Close on its heels came the news about Bri, a young woman with a bright future who has made a difference with her beautiful, well-written and inspiring vegan blog. All these women reminded me of my mother and her struggle with cancer. There came a time when the doctors at Tata Memorial Hospital in Bombay, India, told me to take her home and make her comfortable because there was nothing else they could do for her. We would do the same if she was our mother, they said. They laughed and talked derisively to my sister to who flew down from the US to convince them that there was still hope and that things could be done to improve her quality of life. When it looked like we were hitting our heads against a wall, my sister took a very risky personal decision and insisted that I bring my mother to the US for further treatment. And I did. We had no health insurance. No-one would cover us from India and it was even more bleak in the US. But, because both my sister and her husband are doctors and well-known in their respective fields, the only thing we paid for was three MRIs. $750. My mother was seen by the best neurosurgeons, orthopedists and oncologists in New Jersey. She received radiation, denied to her in India, and was back on Tamoxifen, the then wonder drug. Everything was gratis, except the medication. Unbelievable but true. Armed with written recommendations, we returned to India to find that the doctors were now more open to addressing her case. My mother had a second hip surgery and she lived a reasonable quality of life for more than 2 years thereafter. If we had given up at that time, her condition would have deteriorated very quickly and we would have lost her even sooner than we did. I wish I had known of alternative therapies then. I had access to the Internet through a gracious friend and I surfed using Lynx - anyone remember that text-based web browser? - using a s-l-o-w dial-up modem connection. Information was hard to come by. Things are different today. There are alternate therapies available. And I don't think the insurance agencies have a right to deny these to anyone who seeks them but they do. They have their own long list of reasons. They take our money and then they tell us which treatment we may or may not have. It's grossly unfair. Bri was diagnosed with breast cancer two and half years ago. A mastectomy, chemotherapy and two years of relatively good health later, the cancer is back. It has metastasized to other parts of her body. 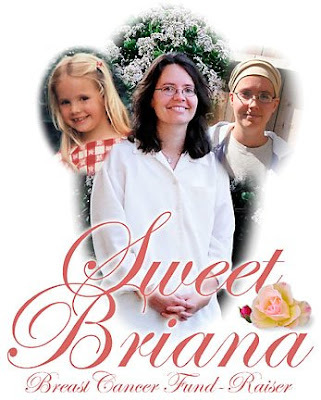 At the age of 15, Bri lost her 41-year old mother to the disease. Now, she’s waging her own war against breast cancer. Bri is going through intensive chemotherapy and other treatments and needs to focus completely on healing and finding the treatment that works best for her. Her health insurance does not cover holistic alternatives which she would like to try. The team organising the June edition of CLICK has organised a fundraiser to help Bri and her family meet her out-of-pocket medical costs for the period of one year. CLICK is a monthly theme-based photography contest hosted by Jugalbandi. This month's theme is: YELLOW for Bri. Yellow is no longer the color of cowardice; it is the color of hope and enlightenment. Rightly so, as it is a very happy and joyous color. Through the work of the LiveStrong Foundation, it has also come to signify the fight against cancer. Take a picture of anything where the main color is yellow. It can be an ingredient, a dish, a concept, cookware, a location - anything in a culinary setting. The deadline for entries is June 30, 2008. The fundraiser will continue until July 15, 2008. The target amount is US$12,000. So this is an appeal to our fellow bloggers and readers to help us achieve this goal. As of writing this, and within 3 days of the event announcement, you have already helped raise over US$3,872 towards the goal of US$ 12,000. The Brownlow family and the CLICK team are simply overwhelmed by your response. It underscores the fact that Bri deserves a chance to explore all options, even if her insurance company thinks otherwise. There's a raffle with exciting prizes on offer. After viewing the list, you may make your donation or by using the Chip-In button on this or any participating site. Once you have donated, fill in the form at the bottom of this page to tell us which raffle prizes you would like to bid for. Your donation can be made securely through credit card or by Pay Pal and it goes directly to Bri's account. This month's photo contest also has two special prizes!. and by publicising this campaign. I sure hope you will do at least one if not all three! Please participate in this month's CLICK Yellow for Bri, so that there is a tomorrow for this passionate and beautiful young woman and her family. Thank you all so very much for all your kindness and your support. thank you, dear manisha, for your kindness, your friendship, your tenacity, your guidance, your empathy, for just being you. This post touches me very close to my heart. My wife was diagnosed with a very aggressive breast cancer five years ago. She had a total mastectomy and had to undergo months of debilitating chemotherapy. What she went through would have broken many people, but she survived and still survives today, five years later. It's so wonderful that my wife is a survivor! And I will do what I can to help others be survivors, too. You can count on me to spread the word and do what I can personally do to help Bri. Thanks for doing this. I went in today through Bri's site and it just made me feel so much better to be able to do something! A big hug, big sister! And thanks for sharing your life story.....Each moment matters, each tomorrow brings more hope. Here's to hope, here's to another tomorrow. Lovely picture for Click and great post! That was a lovely post..
what a beautiful post and a lovely click. i will definitely do everything i can do to help. heart breaking to hear how many of us went through those difficult times. My dad being a doctor knew already how long he is going to live when he was diagonised with cancer. It was heart wrenching to see him suffer day in and day out and unable to say there is a tomorrow for him without pain and suffering. Hope we can do something for our Bri and reach our target!! Wanted to add this as well to my earlier comment. My MIL was diagonised with breast cancer 9 years back, She went to Vellore for treatmentand opted for hormone therapy manisha. After 5 years of treatment, she was given all clear. Its wonderful to see her enjoy each day as it comes and to forget the struggle she had gone through..
words can't be enough to empathise with you. your family was very brave to that at that time. Wonderful post manisha...My heart goes to all the families.hugs to all the survivors..
Thats such a sweet post Manisha. We all pray for Bri and I am sure she will be fine. Wonderful post, Manisha. My heart goes out to each and every reader whose life has been touched by cancer. You are so true is saying that we are seeing more people nearer to us being effected by cancer Manisha. Until a few years back, cancer was always a thing that affected people far far away, in a different land may be for me. But now, just through blogging I have seen many being effected by Cancer and many more fighting it with the kind of strength I cannot fathom. I just pray to God that He gifts everyone who is unfortunate to have cancer with the strength to live past it. It should have been a harrowing experience to you and your family. Hugs to you M! Lemons...citrus rinds. Very strong anti-oxidant. Just today I went searching online for a new lime pickle recipe...I mean, I have 5 kinds here already- including yours of course- but, I thought, hey, since I can get them really cheap right now...might as well, you know? Are you personally aware of how many food-bloggers have made your pickle?!!! O!...M!...G!...! Over and over I saw: "I made Manisha's pickle...I thought I'd try out Manisha's pickle...blah blah blah". At first it was really annoying...but then...I think that, because of those two (yeah...great, tasty, yodle-inducing) recipes that you stuck out in cyber-space, you can already take credit for gunning down several thousand million gwawdzillion free radicals. Congratulations. You seem to be a lady of much strength and grace. God bless. 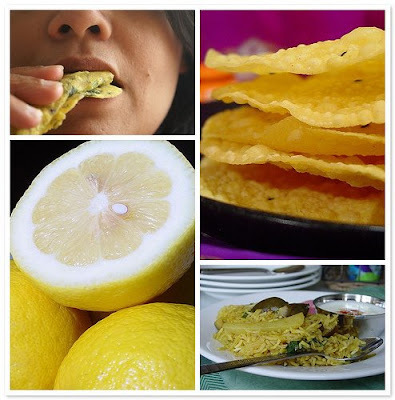 Manisha, thanks for sharing it with us. It's definitely about a better tomorrow.